After launching the Galaxy A6 (2018), Samsung has launched a new smartphone in its home country of South Korea. Dubbed Galaxy Jean, the handset is a re-branded version of Galaxy A6+ (2018) that was released back in May this year. 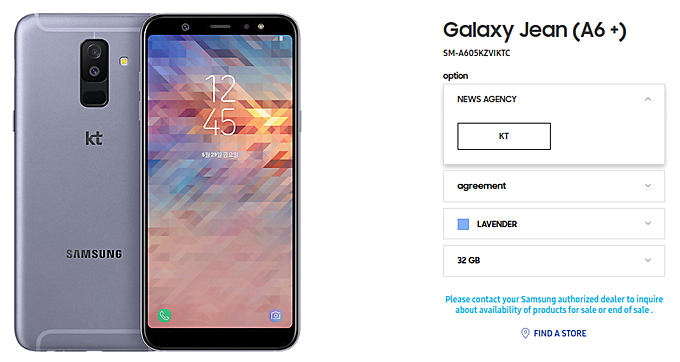 The phone’s listing on the company’s South Korean website itself confirms its A6+ – even the model number matches that of the standard A6+. The smartphone is available through carrier KT in the country, which is selling it for KRW 440,000 (around $395 currently). Available color options include lavender and black. The only major difference between Galaxy Jean and Galaxy A6+ is memory configuration. While the former features 3GB RAM and 32GB memory, the latter is available in 4GB/64GB configuration as well. Rest of the specs remain same, meaning the Galaxy Jean is also powered by an octa-core, 1.8GHz processor, and features a 6-inch display. There’s a 16MP+5MP camera setup on the back and a 24MP shooter on the front. A 3,500mAh battery is there to keep the lights on. Note that South Korea is not the only country where the Galaxy A6+ (2018) is available with a different moniker – in China, it’s on sale as the Galaxy A9 Star Lite.